Inspiring Ideas with artist Jeanne Winters: Tomatoes - It's What For Dinner! Tomatoes - It's What For Dinner! I am LOVIN' the ripe, juicy tomatoes from our garden this week! And when I say "our" I mean my husband's! Yes! - he does it ALL. Well, he does have a little help ... from our two toddlers, that is. They love to trot out there when daddy gets home from work and see what they're allowed to pick that day! I love that they love it and perhaps when my two black thumbs fall off and die two green ones will replace them and then I'll be able to be trusted with living plants. But I digress. When it's tomato season, I mob the cheese guy for all his fresh mozzarella and we're in business! We are fans of "salad caprese" in its many forms and yesterday I came up with a related concoction minus the balsamic vinegar that I grow quickly tired of shortly after the season opener. :-) Well, actually I "minused" the basil in this one, too, so I'm not sure if it's still even related to Caprese, but let's pretend! 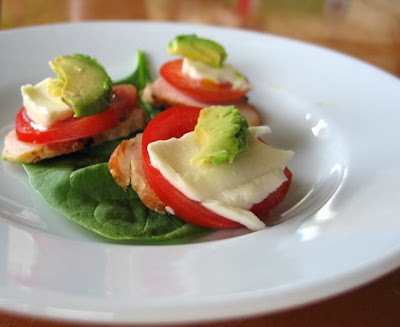 I sliced grilled chicken breasts, then layered with tomato, fresh mozzarella and SUPER ripe avocado. Without the strong balsamic and basil, the other subtle flavors blended yummily! And ... it's Low Carb! 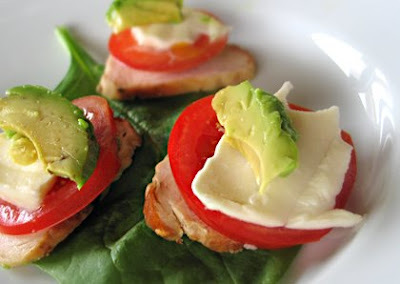 A perfect lite lunch or appetizer for your summer dinner party! Please share in the comments what you love to make with your garden tomatoes! See my post from last year for another summer tomato recipe. I love to make my version of margherita pizzas - any type of crust (I often use pita bread), topped with sliced tomatoes, mozzarella cheese, and a lot of basil. those look totally yummy! stopping by from SITS to wish you a HAPPY SATURDAY SHAREFEST! Yummy! I wish we had a garden, but I too have two black thumbs. My husband has some wonderful clients that send home beautiful heirloom tomatoes with him. I have been enjoying them all week! Going to have to try this salad...looks DE-LISH! Oooooohhhhh wow! That looks amazingly yummy. Since we are so far north, our tomatoes are still far from ripe, but one of my favorite things to make with fresh tomatoes is a lightly cooked tomato-basil-garlic-parmesan pasta sauce. I do it all by "feel", so unfortunately I have no recipe. I also love slicing them, sprinkling them with a little salt, and eating them plain! Jeanne, I've been poking around for half an hour ... I LOVE your blog. It's beautiful, and you take beautiful pictures to illustrate your crafty, creative ideas! Thanks for stopping by my blog earlier and for taking the time to leave a comment. I will certainly be back to catch up on your archives and read about all of your new ideas, too!